The R2-D2™ ANA Jet, a Boeing 787-9 Dreamliner, rolled-out from the Boeing Everett Factory for the first time this morning (September 12). 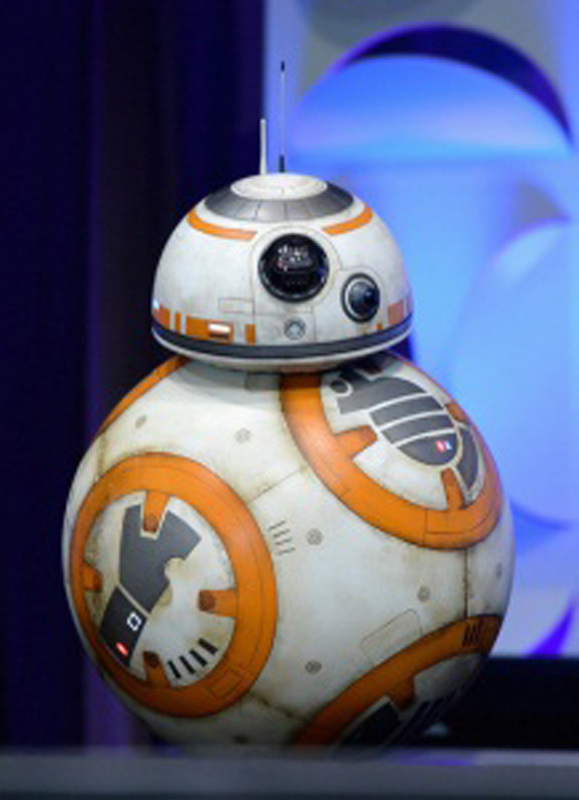 The R2-D2™ (below). ANA Jet is the first of three planes to be decorated with Star Wars characters as part of an agreement between ANA, Japan’s largest airline, and The Walt Disney Company (Japan) Ltd.
On October 18, the R2-D2™ ANA Jet is scheduled to go into service on international routes, initially as flight NH116 between Tokyo and Vancouver, and then fly between Japan and other cities in ANA’s robust international network including the US (Seattle and San Jose), Europe (Munich, Paris and Brussels), Australia (Sydney), China (Beijing), and Indonesia (Jakarta). 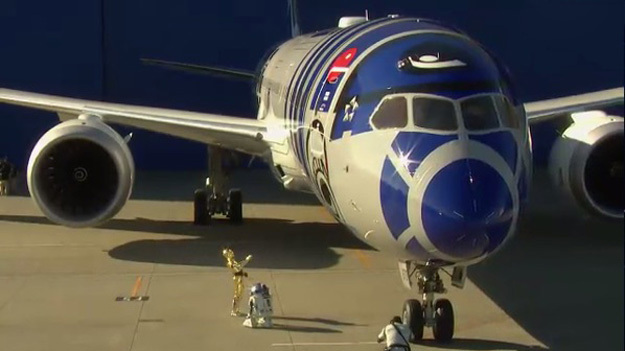 The R2-D2 motif is imprinted onto the cockpit and front half of the jet’s main fuselage, while the Star Wars logo spans the length behind the wings. The interior of the 215-seat passenger plane will feature themed in-flight decorations, such as headrest covers, paper napkins and cups, and passengers will be able to enjoy all six of the currently released Star Wars films as part of ANA’s extensive in-flight entertainment options. This will be the first time that any of the Star Wars movies have been included as part of an in-flight entertainment system. Two additional planes decorated with BB-8, a brand new character from Star Wars: The Force Awakens and R2-D2 will take to the skies following the R2-D2™ ANA Jet. The first, a Boeing 767-300, will begin flying domestic Japanese routes in November and then, in March 2016, a Boeing 777-300ER, is scheduled to start serving international routes principally between Japan and North America (the exact routes have yet to be announced). Fans will be able to see the planes’ schedules at http://www.ana-sw.com. Today’s ceremony began with an introduction from Ihssane Mounir, Senior Vice President of Northeast Asia Sales and Marketing at Boeing, who welcomed the crowd that included journalists, R2-D2, C-3PO and Stormtroopers. 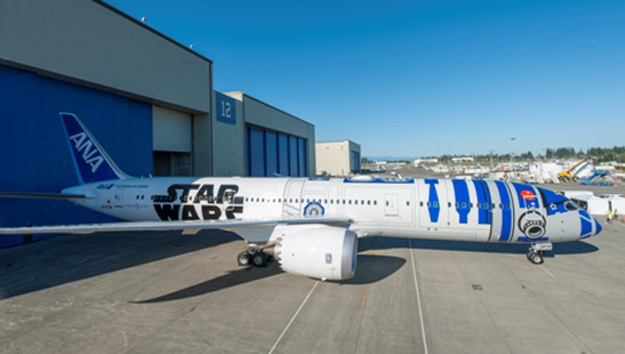 When the official Star Wars music began to play, the Paint Hangar doors at the Boeing Everett Factory opened, unveiling the R2-D2™ ANA Jet to the world for the first time. Routes and flights detailed on the above site are provisional and subject to change without notification. Star Wars movies to be shown from November 1, 2015 to January 31, 2016 on all international routes. The routes are tentatively set as New York, Chicago and Houston, but this is subject to change. All Images by ANA/Star Wars Project. This entry was posted in ANA-All Nippon Airways and tagged 34530, 5Y-JAP, 787, 787-9, 787-9 Dreamliner, All Nippon Airways, ANA, Boeing, Boeing 787, Boeing 787-9, Boeing 787-9 Dreamliner, Everett, PAE, Paine Field, R2-D2, Star Wars on September 12, 2015 by Bruce Drum. A new video from ANA. This entry was posted in ANA-All Nippon Airways and tagged All Nippon Airways, ANA, Star Wars on August 20, 2015 by Bruce Drum. 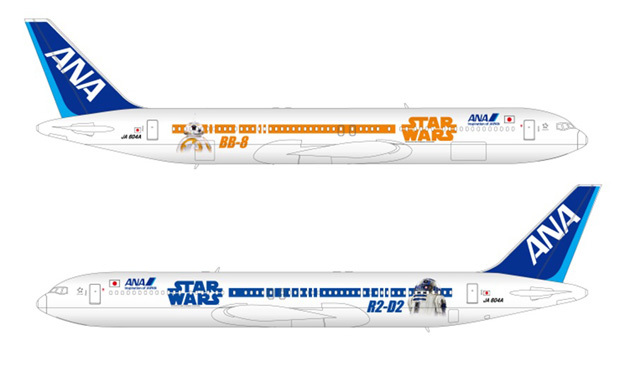 ANA, Japan’s largest airline, today announced that two more of its planes will be decorated with Star Wars characters as part of an agreement with The Walt Disney Company (Japan) Ltd. BB-8, a brand new character from Star Wars: The Force Awakens scheduled for theatrical release in December 2015, will be displayed on the livery of the BB-8™ ANA Jet, a Boeing 777-300 ER (below). 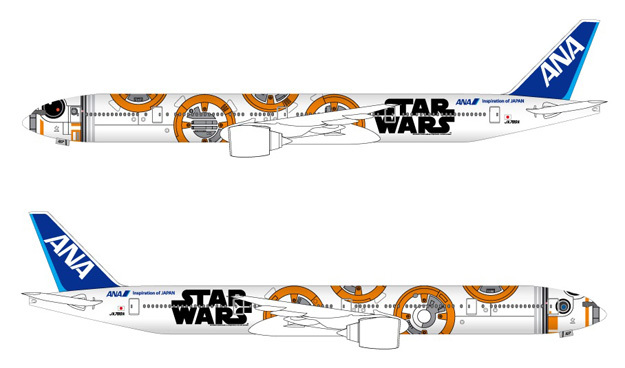 ANA also announced the Star Wars™ ANA Jet, which will showcase both BB-8 and R2-D2 on the outside of a Boeing 767-300 (below). 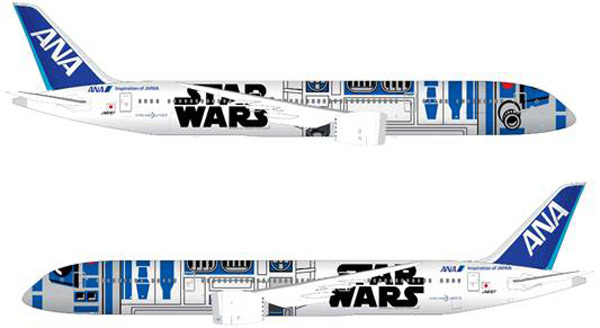 These Star Wars themed planes will join the previously announced R2-D2™ ANA Jet, a Boeing 787-9 Dreamliner. Through this combination of characters, ANA hopes to welcome more passengers of all ages from around the world. ANA launched the Star Wars Project in April 2015 after signing a five year promotion license contract for the Star Wars brand with The Walt Disney Company (Japan) Ltd. As part of the agreement, the ANA Star Wars planes’ will also display in-flight decorations, such as headrest covers, paper napkins and cups featuring Star Wars characters – more details will be announced at a later date. 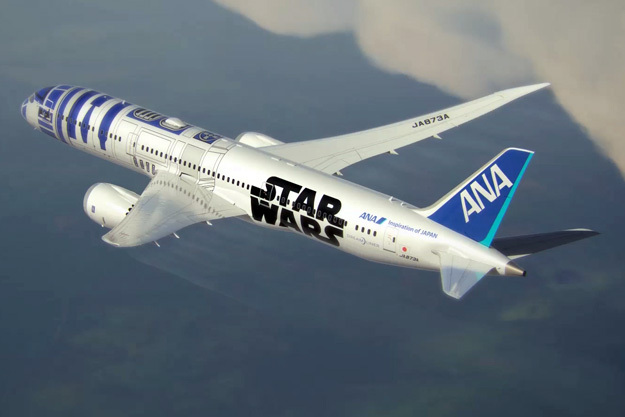 The partnership also means ANA will be the only airline in the world to offer all six of the currently released Star Wars films as part of its extensive in-flight entertainment options on international routes. This will be the first time that any of the Star Wars movies have been included as part of an in-flight entertainment system. 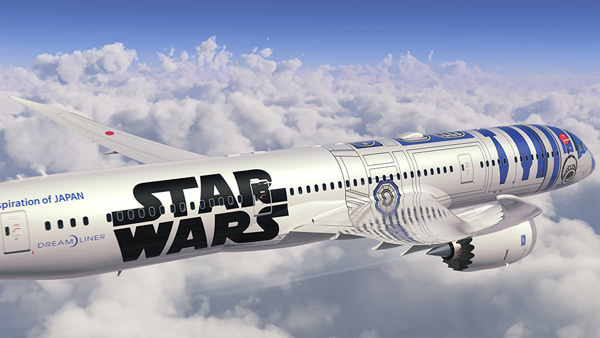 The three Star Wars™ Jets will fly international and domestic routes. On October 18, the R2-D2™ ANA Jet is scheduled to go into service on international routes, initially as flight NH116 between Tokyo and Vancouver, and then fly between Japan and other cities in ANA’s robust international network including the US (Seattle and San Jose), Europe (Munich, Paris and Brussels), Australia (Sydney), China (Beijing), and Indonesia (Jakarta). In November, the Star Wars™ ANA Jet will fly domestic Japanese routes, and then in March 2016 the BB-8™ ANA Jet is scheduled to start serving international routes principally between Japan and North America (the exact routes have yet to be announced). Fans will be able to see the planes’ schedules at www.ana-sw.com. 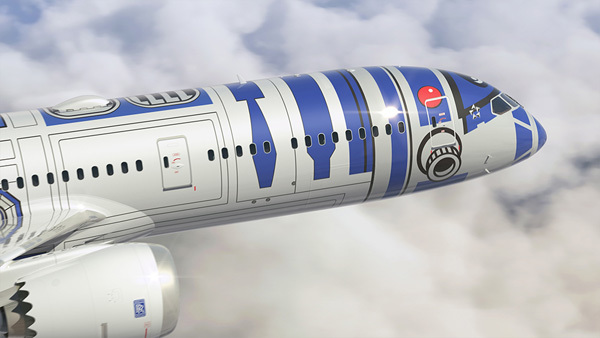 This entry was posted in ANA-All Nippon Airways and tagged All Nippon Airways, ANA, BB-8, Boeing, R2-D2, Star Wars, Star Wars characters, Walt Disney Company on August 18, 2015 by Bruce Drum. 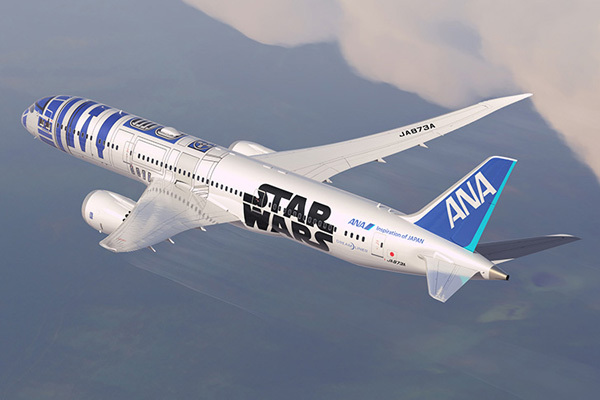 All Nippon Airways (ANA) (Tokyo) announced today it will introduce Star Wars livery, with the iconic R2-D2, on its newest aircraft 787-9 Dreamliner (drawings show the upcoming Boeing 787-9 JA873A, msn 34530) to mark the beginning of a five-year ANA Star Wars™ Project and agreement with The Walt Disney Company (Japan) Ltd.* This marks the first time a Star Wars character will appear on the exterior of a commercial aircraft. 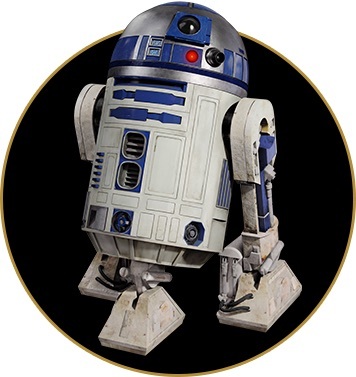 The R2-D2 design was unveiled to Star Wars fans today at Star Wars Celebration in Anaheim, California, just months prior to the character’s appearance on international flights** in autumn of this year. Brilliant idea ANA. Well done. Below: R2-D2 from Star Wars. This entry was posted in ANA-All Nippon Airways and tagged 34530, 787, 787-9, 787-9 Dreamliner, All Nippon Airways, ANA, ANA-All Nippon Airways, Boeing 787, Boeing 787-9, Boeing 787-9 Dreamliner, JA873A, R2-D2, Star Wars, The Walt Disney Company on April 16, 2015 by Bruce Drum.